2019 Series begins! Every other month beginning in February. Get ready for the Fourth Trimester! A normal birth is best for mothers and babies. Even though there is medical care during labor & birth, it is not a medical event. Soaring rates of cesareans, inductions, epidural anesthesia, forceps and vacuum deliveries have offered no improvement in birth outcomes. Today with 98% of births experiencing routine medical interventions, we are losing our understanding of what normal birth really is. HypnoBirthing® provides mothers and fathers to-be a unique method of achieving a more relaxed, natural birth enhanced by self-hypnosis techniques, while learning through the childbirth education classes how to use “the missing link”, that allows women to labor longer at home, using the “natural relaxant” of the body and instincts to bring about a safer, easier, more comfortable birth, avoiding many interventions that typically occur at hospitals when labor does not progress rapidly. 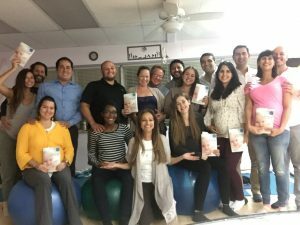 Learn to let go of the fear-tension-pain syndrome with emphasis placed on mother relaxing & meditating during each natural wave of the body, helping baby to descend while tapping into a deeper consciousness, trusting in her bodies ability to labor while saving the energy needed to breathe and birth your baby. Birth Partners and Fathers are loving advocates and companions not coaches. 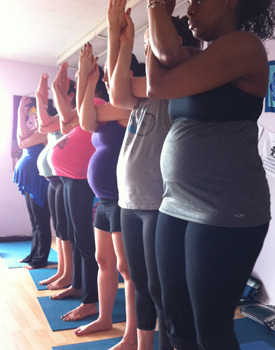 Childbirth classes help parents prepare to be calm and confident in birth and newborn care. The group classes are open discussions and each couple’s questions/concerns are addressed. 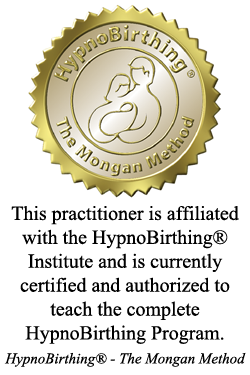 Learning the HypnoBirthing® method can greatly reduce the need for chemical anesthesia, allows your birth companion to be an integral part of the birth process, shortens the first stage of labor by several hours, eliminating fatigue. HypnoBirthing® allows mother to let go of the stress of rushing to bring baby into the world in reducing the need for unnecessary “pushing” by breathing baby down to crowning. Babies come into the world awake and alert, postpartum recovery is much easier for Mom therefore allowing birth to be the “Celebration of Life” it is meant to be.